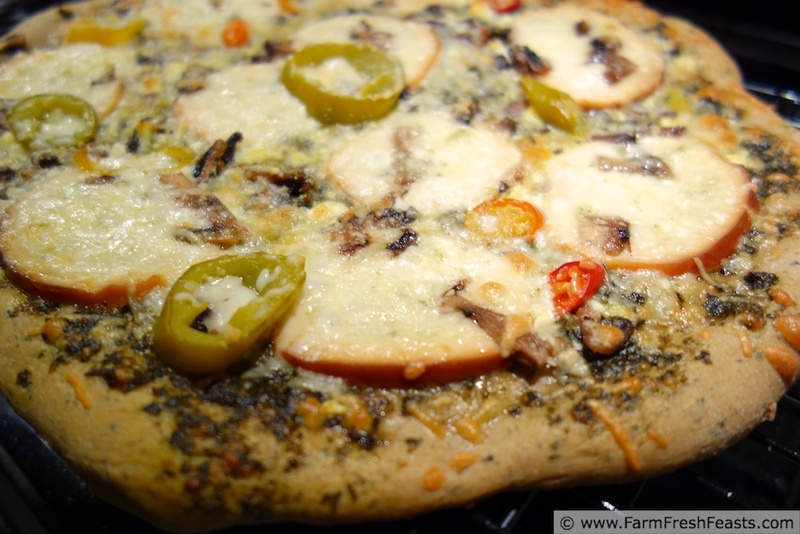 Pickled pepper pesto pizza. I was giggling while writing this post (writing the old fashioned way, like the oats in my soaked oat muffins) in my breakfast nook. I thought I'd have a whole weekend to write at the sled hockey tournament, but instead I was yelling encouraging the team or watching some show about moonshine preppers panning for gold in deep-earth bunkers. It was on TV, I couldn't look away. My daughter will be home soon to claim her breakfast nook study space, so I must download this recipe before it flies out of my brain. And you thought I took a photo of the ingredients to show you what's in this pizza. Ha! I mean, it's great if you find the photos useful as well. Really. <days later>I'm still giggling to myself typing this post up in the lobby of the rec center where my son is at wheelchair basketball practice. People are starting to stare. Back to the point of this post. I was cruising past the fancy cheese counter on another milk run (who is feeding these kids?) when I saw a magical markdown sticker in the vicinity of the mozzarella balls. This time it was smoked mozzarella, so of course I snagged it to give it a try. Heather (of garlic oil fame, though there's so. much. more. to her) eats marvelous pizza from some place called the Magic Mushroom. Never been there. 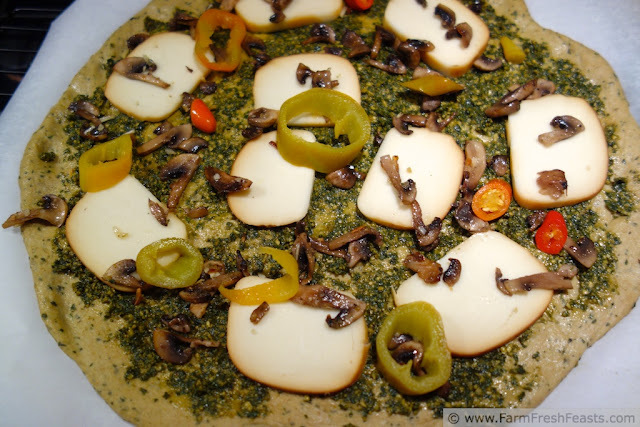 But when Heather described her favorite pizza pie, it sounded like I could adapt it, play with my pickled peppers and pesto, and use this smoked mozzarella. Smoked mozzarella is different than fresh mozzarella on a pizza in one dramatic way--it doesn't color outside the lines. When topping a pizza with fresh mozzarella, you need to be careful not to put your slices too close to the edge for fear that they will run off all over your pizza stone. Crispy mozzarella discs pried off a hot pizza stone are totally worth the burned fingertips. Smoked mozzarella imparts a deeper, smoky (I know, surprise, I'll never be a food writer) taste, something which pairs well with the pesto and mushrooms. The peppers and feta really make this pizza pop. Normally, I don't feel like I make gourmet pizzas. 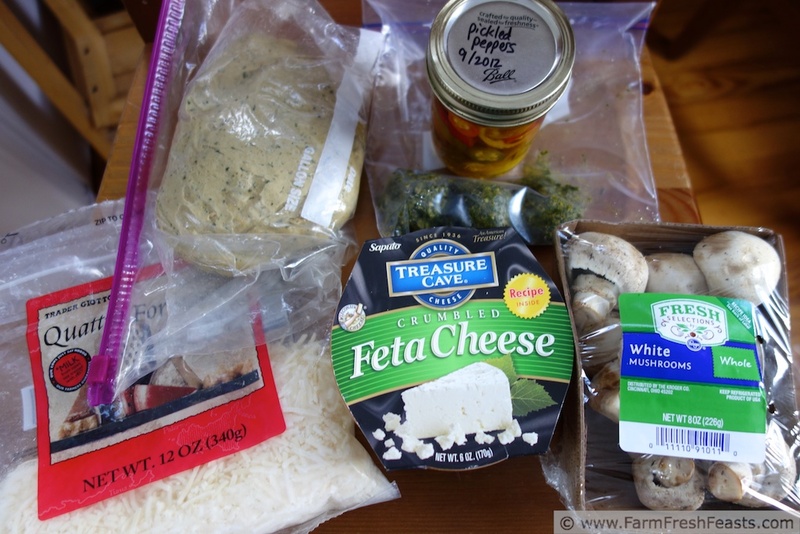 I'm just cobbling together the ingredients I've got on hand, from my farm share or good deals from the grocery store. But describing this pizza . . . well, it sounds pretty fancy and high falutin' to me. If you're new to making pizza dough, refer to my Pizza Primer post for methods, hints, and tips. Dissolve yeast in water in the bowl of your stand mixer, fitted with a paddle, while you gather the rest of the ingredients. Add pesto, flour, and salt. I love my kitchen scale for this--I stick the bowl on the scale, zero it, and just dump flour in until the scale registers 8 1/2 ounces. No fluffing, no leveling, easy as can be! Get one at Bed Bath and Beyond using a coupon. 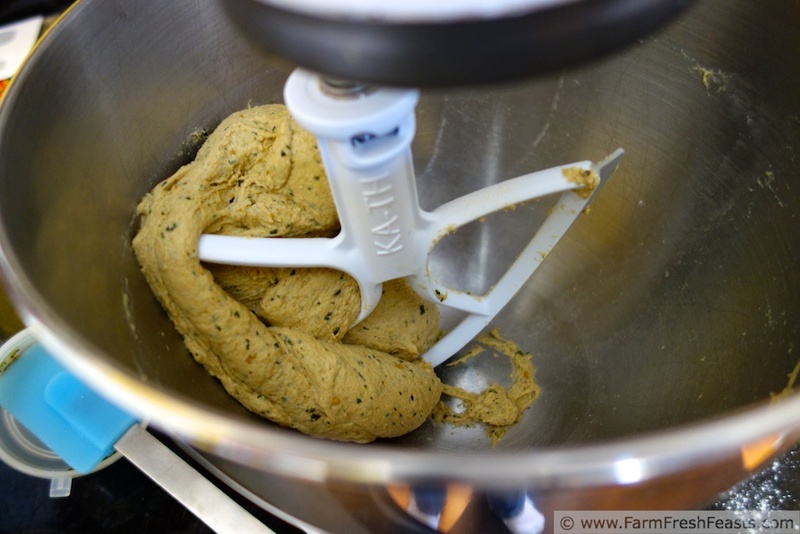 Mix on low-medium until a ball of dough forms. 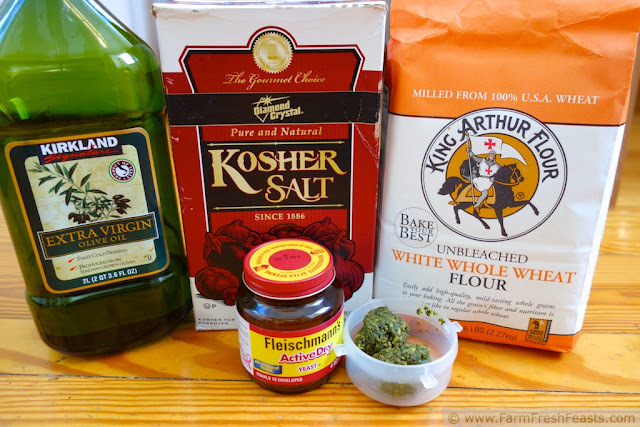 I do not add extra olive oil to this dough because there's olive oil in my pesto, but you may find your dough a bit dry or rough, so add a tablespoon of oil if it seems to need it. I make my dough at least a day early, and just store it in an oiled bowl or bag depending on how much room is in my fridge. Preheat oven to 450 degrees--don't forget the baking stone*. In a small skillet w/ a splash of oil, sauté the mushrooms until they have lightly browned. Shake a bit of Onion Onion and Garlic Garlic on top (NOTE: use any dried onion and dried garlic product, or a tablespoon each of the fresh stuff if you're organized and plan ahead and don't look at the mushrooms and think they ought to have a bit more flavor as you're fixin' to top the pizza). Set aside. On an oiled piece of parchment paper stretch out the dough into an approximate circle. Spread pesto up close to the edges. Top with mozzarella, mushrooms, and peppers. Sprinkle feta and shredded cheeses on top. Bake for 5-8 minutes, then shake the crust off the parchment paper and bake directly on the stone for another 3-5 minutes until the cheeses are browned and bubbly. *Use a cookie sheet if you don't have a baking stone. Cool on a rack a few minutes, then slice and serve. And consider yourself high falutin' for making a gourmet pizza at home! 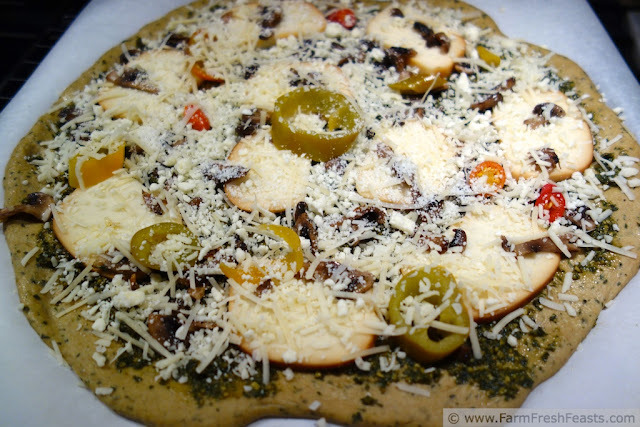 This pizza is shared with the From the Farm Blog Hop and the Clever Chicks Blog Hop, the Wednesday Fresh Foods Link Up, What's Cookin' Wednesday, Food on Friday and What's In The Box. No, you're wrong Kirsten, you should BE a food writer. Who wants to read humorless highfalutin piece of writing when it comes to food? I'd have more fun reading yours. Really ... I'm not brown nosing. You may brown nose all you want if your comments are going to make me smile so big! I love it when you say high falutin', and I'll tell you what, I was there with you, giggling my way through this entire post (Who is watching those kids?). I love this post; your mad comedic skills (who needs food writers anyway) really shined through. I'm also going to make this pesto pizza pie, sans picked peppers. I can't wait to try this crust now that I am a pizza dough maker (three times and counting). I'm glad you're making pizza--your photos look really delicious to me. Please share how it turns out! Having a well-stocked pantry is a huge thing, I agree. It would be easier if my kids drank less milk and I wasn't always popping into the store to get a gallon and coming out with a few extra goodies--that keeps the place well-stocked for sure! It also makes for interesting meal combinations as we eat down the shelves prior to a PCS . . . I know, I wouldn't have thunk up this combo if not for another Heather's advice and counsel. Thanks for the link, I'll come check it out! I Love that you put pesto into the crust!!! I totally need to try this! It's so easy to fix--essentially you're swapping the oil for prepared pesto. I'm glad my family doesn't want the exact same pizza week after week, and is willing to try my creations. Oh, that foodie prayers could be answered so easily! There's always another new thing coming around then bend for me . . . thanks for hosting! YUM! 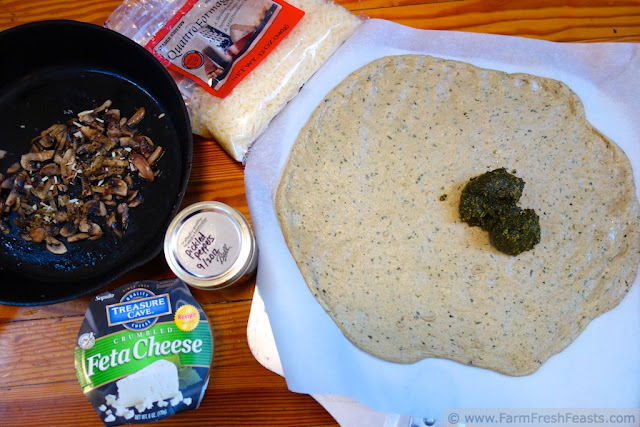 I used this recipe mostly as “flavor inspiration”, since I used my own basil pesto and pizza dough…but I have to give credit where credit is due because I never thought of putting all that together! I also added a head of broccoli, chopped up, because I had it in the fridge and wanted more veggies. Great with cracked red pepper! This will be in regular rotation from now on!